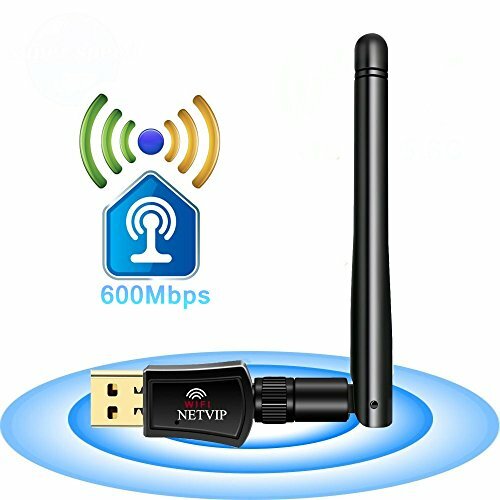 600Mbps WiFi Adapter USB Wireless Network Card Dual Band (5.8G/433Mbps+2.4G/150Mbps) High Gain Antenna 802.11b/g/n WLAN Dongle for Laptop Desktop PC,Support Windows XP/Vista/7/8/10,Linux,Mac OS X by NETVIP at AABX. MPN: A-001. Hurry! Limited time offer. Offer valid only while supplies last. New experience of enjoying 5.8GHz+2.4GHz dual band with OFDM wireless technology - The unique design brings you easy and free wireless digital life. New experience of enjoying 5.8GHz+2.4GHz dual band with OFDM wireless technology - The unique design brings you easy and free wireless digital life. Help your computer receive WiFi signal,turn wired network into wireless connection,make your desktop can connect wireless network easily,breakthrough the wired limitation. Create a Hotspot with WiFi Feature simply,enable you share your WiFi with your friends or family freely,without the limit of time and space. How To Install The WiFi Adapter ?  HIGH SPEED : Up to 600Mbps Wi-Fi speeds on 5.8GHz (433Mbps) or 2.4GHz (150Mbps) bands,provide lag-free experience for HD video streaming and gaming.  SAY GOODBYE TO SPOTTY WI-FI DEAD ZONES : With 2dBi high gain long range antenna,you don't have to face with slow internet speeds at home,or even if you're outside the house,providing strong penetrating ability and stability.  WIDE COMPATIBILITY : Perfect for PC Laptop Desktop,Support Windows 2000/7/8/10/XP/Vista, Mac OS, Linux.Windows 10 is plug and play. Setup CD included.Once you've run the software, you can simply insert the adapter to get connected.  INNOVATIVE MINI DESIGN : The mini and compact design makes the USB wireless adapter convenient to carry for all mobile users - You can carry it wherever you want.  POWERFUL WARRANTY : We offer 12 month worry-free warranty,if you have any questions when using, just contact us. We must give you the best customer service and guarantee 100% satisfaction.